At least one Season is required in order to use timetables. If you don't have any seasonal changes to your events you should create a "Year Round" Season starting on January 1st and ending on December 31st. Give this Time Table a "Name" and "Save"
Assign the Time Table to a Season and click "Save"
Enter a "Start Time" for this event and "End Time"
Select a Product that this is event should be for. If you haven't set up a product beforeclick here. Select the Resource Group this event uses. If you haven't set up a Resource click here. The fields left are optional. Read below to find out more, if you have finished remember to click "Save and Close". Relative Publish optional – Sets the Relative Publish time prior to the event. For example, if you wanted to say that these events should only appear to the customer 3 days and 6 hours prior to their event date, you would set 3D 6H. Relative Publish Relative Day optional - This setting is used if you have a fixed day of the week that you want to 'reveal ' all you availability on. For example, if this is set to Tuesday (using the same Relative publish info shown above), then the Relative Publish will look back 3 days and 6 hours prior to the event and then publish the event on the first Tuesday prior to this date. 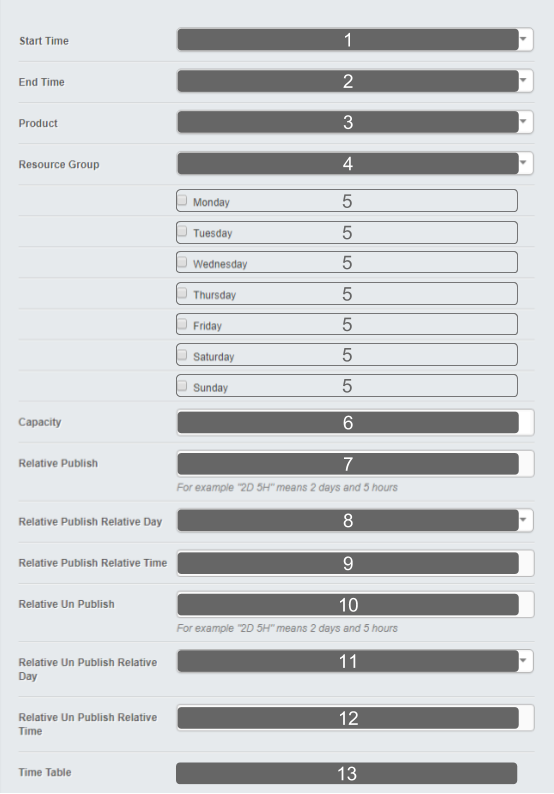 Relative Publish Relative Time optional - As above, but with the added detail of a time of publishing. Inputting 09:00 in here alongside all the rules previously mentioned would result in your events being published 3 days and 6 hours prior to the event on the first Tuesday at 09:00, prior to this date. The same rules apply to the UnPublish fields. Upon returning to the main Timetable screen, click “Save & Close”. Every week the system will create the new events that you have asked it to make. You can adjust what day of the week the system does this, how far into the future it should jump before creating events and how many events it should create. This process is run at 45 minutes past the hour, each hour of the day that you have set. Note: Therefore if you are testing this you would need to set the day to current day and then wait till 11:45, 12:45 etc before the events would be created. Here you can set which day of the week the events should be built on, how far in advance the system should build the events and finally how many weeks to produce at once. Every Monday the system would take the current date (eg 12/10/2016), and then move it forward 2 weeks (eg 26/10/2016). It would then start creating events from this date forward based on what is in the timetables until a further 2 weeks worth of events have been created. Once you've chosen what you want these settings to be press "Save".